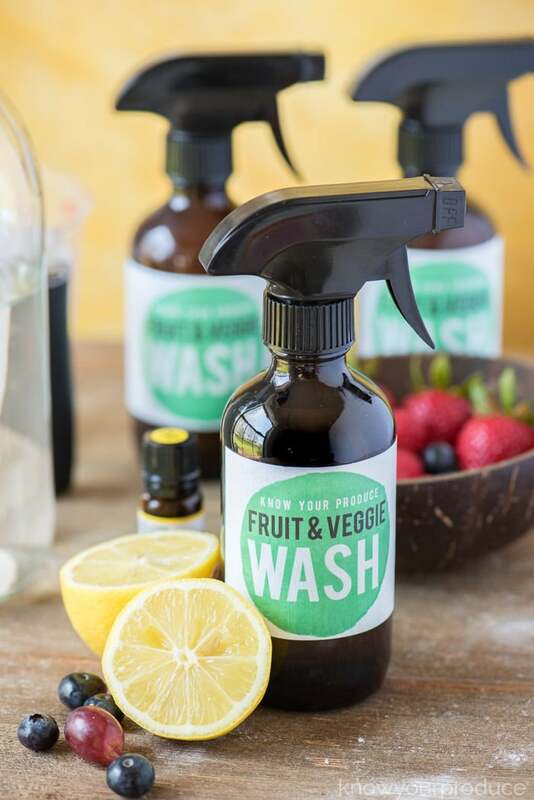 Easy fruit and vegetable wash using organic and natural ingredients to clean your produce. If you’ve been using a vinegar fruit wash or even a baking soda fruit wash with water, you are cleaning your vegetables with natural veggie wash already, but now you have an easier solution, homemade veggie wash that’s mixed and ready to use! Clean all your produce with our Fruit and Vegetable Wash! The fresher, the better, the cleaner, well that’s the best. These days it’s like every blog/website is telling you about ”Clean 15, The Dirty Dozen, What to buy organic, What not to buy organic”, and most of them just give me a big headache, to be honest. We purchase everything we can organic, and if it’s not available in organic, we purchase locally. This makes life so much easier, plus when they come out with “Oops, make that the dirty 13” we’ll be okay. In all honesty, if you’re eating fresh fruits and vegetables >> THAT’S AMAZING. 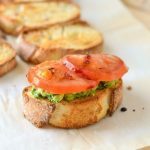 I can’t tell you how many times I go to the grocery store and people are spending twice as much as I am on processed, prepackaged, and little to no ingredients. 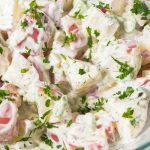 Ingredients are things that go into food and what you use to make a meal, not already prepared. I would love to challenge you to completely avoid the inner section of the grocery store, instead just go to the produce, dairy, and butcher if needed. Okay, so this post has turned into something else because I’m a run on sentence type of gal, and I have too much to say apparently. The reason you’re here is to learn how to clean your produce! 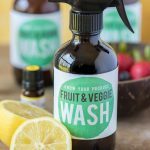 We’re going to show you how to make our fruit and vegetable wash and use it to clean fruit and clean vegetables too! You have two options, you can make it into a spray or a wash too! We suggest using it as a spray on hard produce and as a wash on soft produce. For example, how to wash vegetables that are soft, you’ll want to put it in a water bath with some of the cleaner. You can add some baking soda to strengthen the homemade fruit and vegetable cleaner for tough to clean produce. When we use it as a fruit cleaner for something like strawberries we’re extremely careful as something soft like strawberries will take on the flavor of the fruit cleaner. 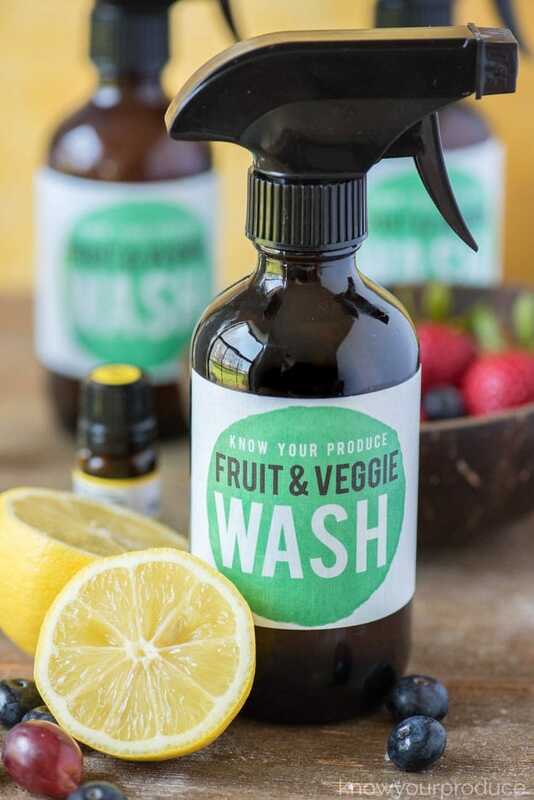 This is a water and vinegar veggie wash, but we add essential oils to really help clean those fruits and veggies! 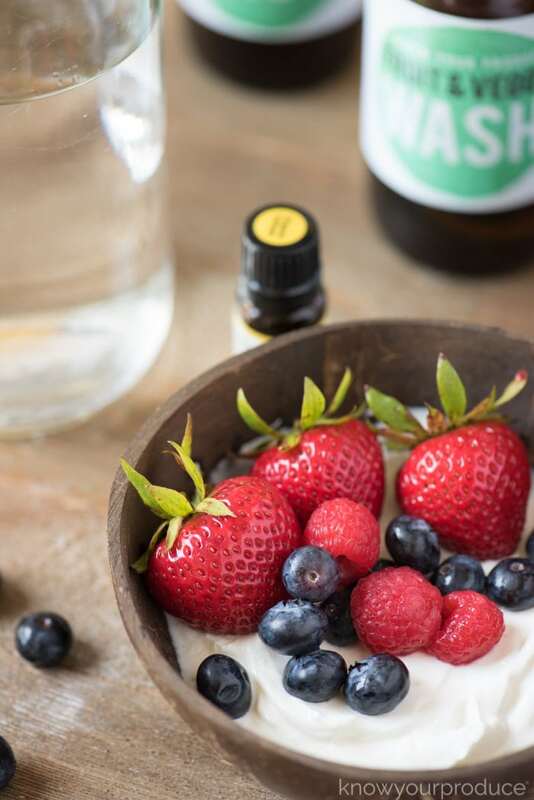 Do you love this homemade veggie wash and fruit wash as much as we do? 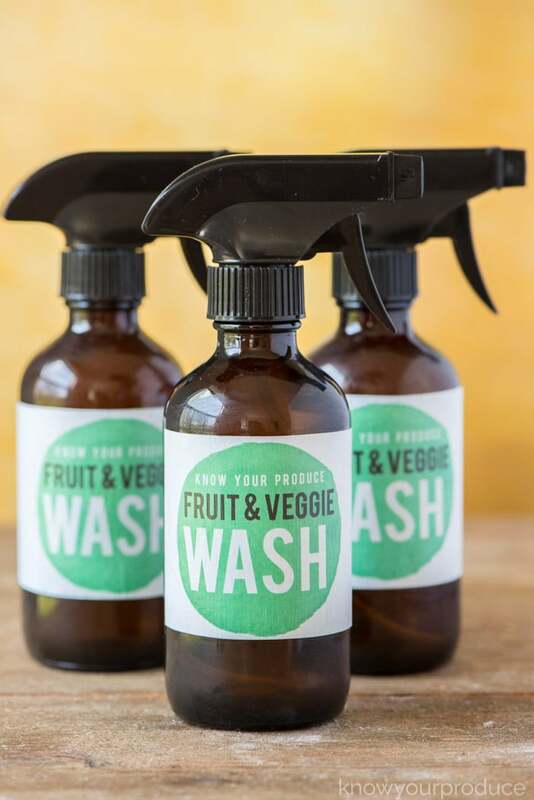 If you want to make your own fruit and veggie wash labels using our FREE printable! We use all natural and organic ingredients to make our veggie wash organic. 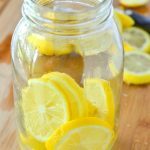 When making your diy veggie wash you want to use a lemon essential oil you trust. 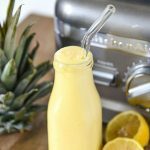 If you’re not comfortable using essential oils since this recipe calls for lemon essential oil, you could also use lemon juice. We would use 1/4 cup lemon juice. 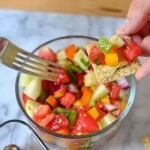 For this recipe, you’re going to want to use a glass spray bottle. Amber glass bottles are even better since they help protect the wash from UV light. Light causes products to spoil quickly, it’s much better to protect them from oxidation by using the amber glass bottles. Why get store bought products for washing produce when you can make organic fruit and vegetable wash for a fraction of the cost at home? Most people have vinegar and water, right? 1 part water 1 part vinegar and then a bit of muscle from a little lemon mixed into the water vinegar solution. When you go to the farmers market you can quickly wash your fruits and veggies now. We like to give our fruit and veggies a quick spritz and then massage so the cleaner an really clean. Once we do that we run it quickly under the tap water to remove dirt, pesticides, and the spray. 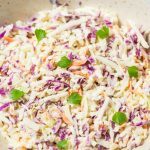 If we’re washing something that needs to be dried, like salad, we’ll do it all at once and then put into our salad spinner, we love this gadget! You can even keep it in the fridge once your lettuce is cleaned. 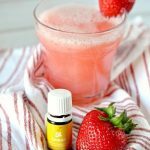 Now you can make your own natural fruit and veggie wash! 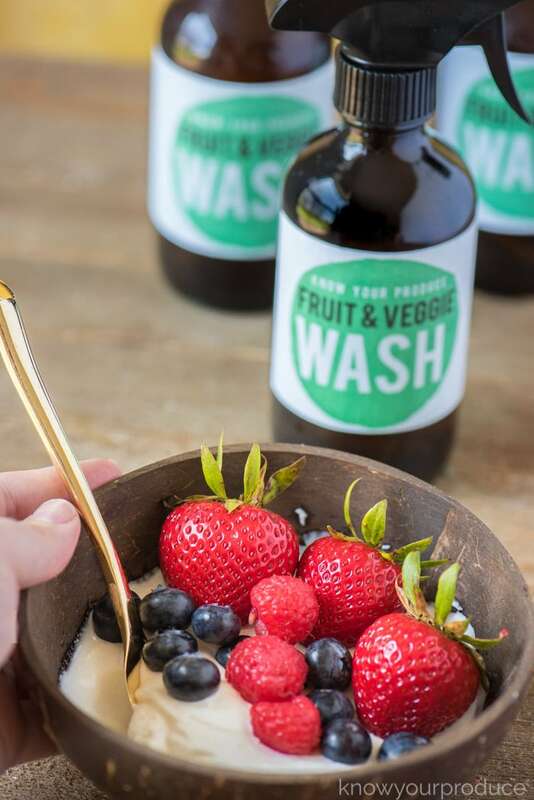 Easy fruit and vegetable wash using organic and natural ingredients to clean your produce. 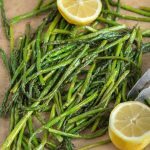 If you’ve been using a vinegar fruit wash or even a baking soda fruit wash with water, you are cleaning your vegetables with natural veggie wash already, but now you have an easier solution, homemade veggie wash that's mixed and ready to use! Spray directly onto produce and rinse well before consuming. For EXTRA dirty fruit and vegetables spray and sprinkle a little baking soda. Give a good massage and rinse well. Also, we prefer brown or blue glass, as clear doesn't protect the contents from degrading. Our daughter won’t take her hands off it. She controls the spray bottle, and that’s totally fine and encouraged. We love that she can take part in cleaning her food too. Now go ahead, give your Fruit and Veggie Spray Using Essential Oil a big hug and thank it for all the hard work it will do in the future. 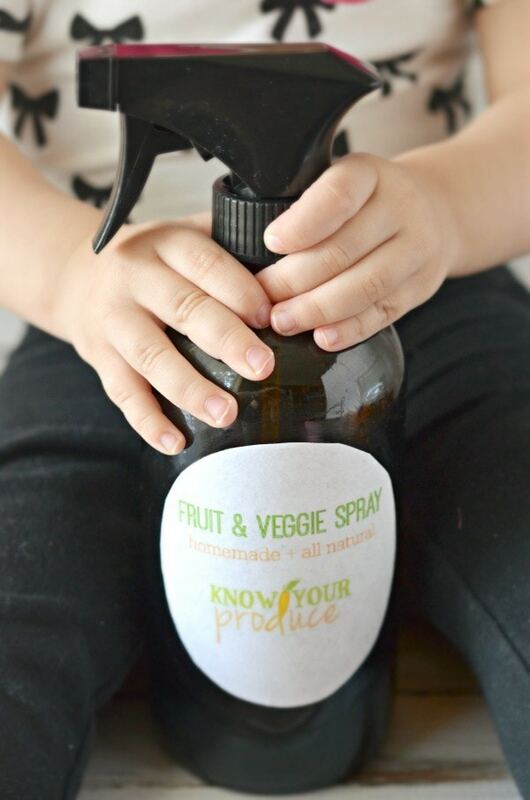 Head over to Courtney’s Sweets to learn how we labeled our spray bottle! Please always use caution when using essential oils. These statements have not been evaluated by the Food and Drug Administration. 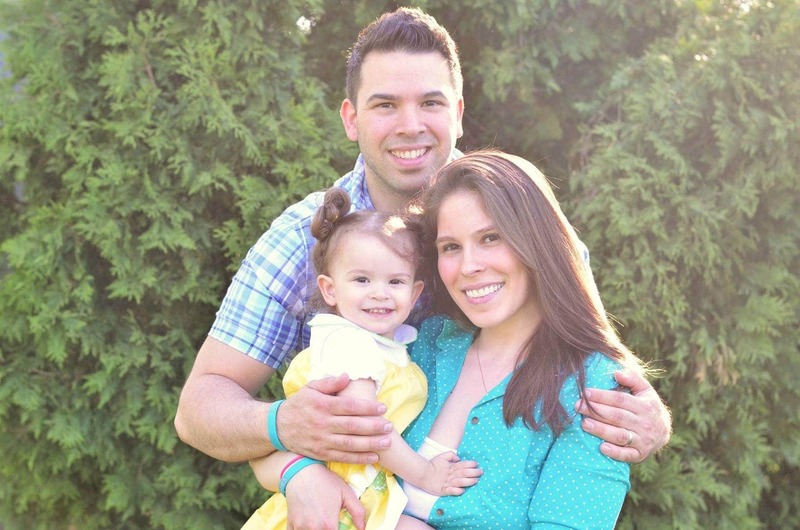 This information is not intended to diagnose, treat, cure or prevent any disease. The information on this site is not intended or implied to be a substitute for professional medical advice, diagnosis or treatment. Please confirm any information obtained from or through this website with other sources, and review all information regarding any medical condition or treatment with your physician. Never disregard professional medical advice or delay seeking medical treatment because of something you have read on this website. Again, always consult your physician before using these products. This is the solution I use but I just dump them all in my sink then rinse after 15 minutes. I need a spray for when I’m out and want an apple! Love this. Will be making this! Thank you! Where did you find the dark bottles? How much baking soda do you use?